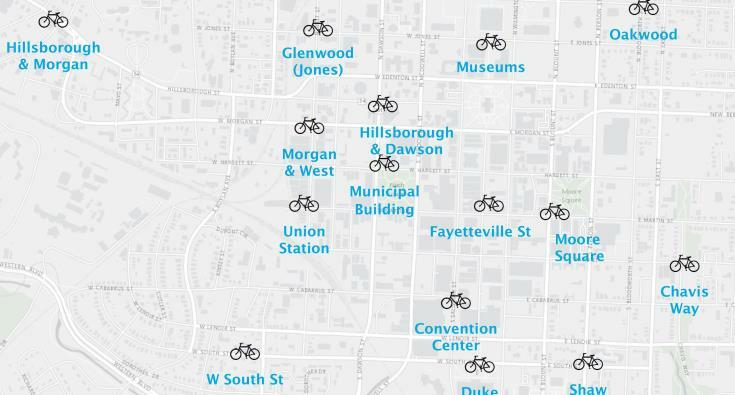 The city has posted their first map of proposed stations for the upcoming Raleigh Bikeshare system. Jump over to bikeraleigh.org to see the whole thing. The system plans for 30 stations and 300 bikes. Planners want the system running by Spring 2018. This map is the first draft of proposed stations and further work is needed to finalize them. The system has stations as far out as the North Carolina Museum of Art, the Walnut Creek Wetland Center, and St. Augustine’s University. Dix, Chavis, and Pullen Parks get stations with the majority being in and around downtown and NC State. Basically each district in downtown has one or two stations as well as the nearby neighborhoods like Oakwood, Person Street, Seaboard, and South Street. I imagine that with planning a bikeshare system, and only having 30 stations, hard choices need to be made. You can’t spread them out too much, making the system less useful. At the same time, they can’t be too close together which makes the system lack coverage. I want to guess that spots like Fred Fletcher, Five Points, and Centennial Campus were on the fence as these locations are outliers on a map with little to no bike paths or greenways in their direction. Next up comes finalizing the station location and announcing rates. Also, I’m hoping there are plenty of e-bikes in the system cause if I didn’t have to actually pedal, you know, that would be great! I’m not sure how centennial campus or the farmers market didn’t get spots. They both have access to the greenway. I can find at least 10 spots I would replace for those two. I can appreciate that it’s a difficult job to prioritize station locations among all the possibilities. I understand that the exercise is part logistical, part political and part economical. The station maps has indicators of all three parts. I think it’s important to remember that 30 stations should not be seen as a final number, rather an initial set of stations. When we make the system successful, the stations can further infill and expand on the edges to broaden its coverage. I’d also suspect that stations that don’t get used will be reconsidered at a future date. I am glad to see that stations put by colleges and universities. I am personally happy to see a station by my condo and at Cameron Village. Both Centennial Campus and the Farmers’ Market are fairly isolated from the rest of the bikeshare stations. There aren’t very many stations you could access from either in the 30-minute time limit of a single ride, especially since both are downhill from the rest of the bikeshare network and there are limited bicycle facilities for traveling uphill towards NC State. NACTO recommends a 1,000-foot station spacing between bikeshare stations for maximum usefulness. I don’t think we can pull that off in Raleigh with 30 stations, but we can get closer. I would save the stations at Dix Park, the Museum of Art, the Wetland Center, and maybe even Meredith for a later phase, and instead try to fill in the northern end of the service area (between Cameron Village and St. Augustine’s), Hillsborough St (between Belltower and West St), or Emo Raleigh (between Chavis Way and Person St). @Matthew, Bike share vendor do in fact transport bikes from station to station logistically for the very reason that you state. Patterns of use will emerge during the “painful” launch. I say this because I’ve lived through the launch of a bike share program in Miami Beach where my other home is. Trucks pulling custom trailers transport bikes around the system throughout the day. The goal is to avoid both empty stations and full stations. The only way for the operator to understand how this will work is to monitor the launch closely and react with an ongoing bike rotation plan. Frankly, a 300 bike and 30 station format will require each station to have a few open slots all the time. It can’t be 30 stations of ten bike slots each. This will especially be true for those stations that are isolated. Imagine showing up to the museum of art station and there’s no place to dock your bike. What do you do? Well, to stay within the 30 minute window without penalty, you’ll have to turn around and hope that you can get back to another station before your time window expires. Conversely, imagine trying to leave the art museum and there’s no bike to be had. It’s for these very reasons that station density is important. Riders need more than one reasonable option to make the system work. I provided this feedback during the public comment phase. I suspect that the operator will find these peripheral stations difficult to manage. The initial system boundaries were set in the Feasibility and Implementation reports (http://bikeraleigh.org/home/images/PDF/20141209_BikeShareBusinessPlan.pdf#page=14) hence none of the outlying stations other than the Art Museum (most requested location) and Meredith (every university has at least one). The map has 31 stations, and the only one I see as potential for getting nixed is Oakwood. It is the only one not really tied to a destination. There aren’t any other “neighborhood” stations. The Art Museum location as the “most requested” is very suspicious to me. It seems like it was a well coordinated effort to make it the most requested despite the fact that its located in a car dependent environment. Certainly there’s a connection to the greenway but the reality is that most people can’t/don’t walk or bike there now. Added to the problem with the museum being a station location is my aforementioned lack of station density opportunities around it. Where would the next closest station be to make sense and give a reasonable second option? It simply doesn’t exist. As for neighborhoods, bike share should be prioritized in high density neighborhoods and destinations within the urban core or on its immediately periphery. Oakwood’s station would be better served by locating it nearer The Lincoln where more multifamily is planned or even down by the original Trophy. That location could serve the W. Morgan destinations, all the high density housing between St. Mary’s College and W. Morgan and the college itself. This may sound crazy, but considering the majority of visitors to the Art Museum arrived in their car. The odds of them riding around the Art museum property/greenway and returning it to the exact same location are pretty high. Hoping to see some your names on the ballot for city planner this upcoming election. @Drew. If that use is the case then the Museum should have its own bike system. Bike share is primarily a public transit option. As the business plan puts it, even yet-to-come Phase 2 “would serve approximately 12 percent of City residents”. Given that about 30% of Raleigh lives ITB, this program doesn’t even cover the majority of them, much less OTB. I’m not saying the program isn’t worth doing, but honestly this is the city’s gift to the chosen 12%. Relax CT. Its a first start. OTB is pointless. People that choose to live out there are ‘car dependent’. Are there other areas that would be reasonable like 5 Points for instance, sure but a balance needs to be struck so you target the areas with the highest potential use first and then let the “I want one, I want one!” crowd come second. Ct, the higher taxes from higher valued land in these areas, more than covers the bike share, and any other perk anyone thinks we’re getting downtown. I think this program is more about keeping up with the Joneses/peer cities. I have used bike shares in Philly, DC, Austin and Boise, and based on that, it feels like it’s a visitor’s thing more than a resident’s perk anyway. I have multiple bikes I use here…the beater I use around town and out drinking is still nicer than anything I ever used from a bike share. I get that BikeShare is supposed to be a transportation system, but it can also be used as just an easy way to try biking in Raleigh whether you’re a visitor or a first-timer. For those reasons, I’m completely fine with a station at NCMA. Complaining that the suburban areas of the city won’t have bike share is like me (a DT condo dweller) complaining that I don’t have a quarter acre lot of my own. We all make choices and mine included paying 2x per ft2 for my housing, resulting in doubling my taxes and consuming less overall services for my tax dollars contributed. I also pay an overlay district fee in my property taxes to pay for (I think) DT’s ambassadors, wayfinding, RLine, trash and recycle bins, etc. My building’s one acre parcel generates tax revenue on about $30M dollars of residential real estate each year and was built on the city’s existing grid and services. Frankly, I am sick of the complaining when it’s the DT residents’ tax dollars that basically subsidize those who live outside the Beltline. Hi everyone, Raleigh’s Bicycle and Pedestrian Program Manager here. I’m a big fan of how bikeshare is generating productive conversation and am very appreciative of the folks who see that planning Raleigh’s bikeshare requires thoughtful consideration of several different factors including existing infrastructure, destinations, and social equity. I did want to offer responses to a few of the comments regarding balancing and the station at NCMA. Above all, bikeshare service should be user-focused. To this end, if a Raleigh bikeshare user arrives at a full dock, Bewegen (the selected bikeshare company) can create a virtual station to allow the user to park the bike near the station and end their trip through a quick phone call to customer service. As for NCMA, I assure you there’s no conspiracy there. Out of 155 unique station locations identified in the crowdsourcing map associated with the Feasibility Study, it received the most “likes” at 28. The 2nd and 3rd most popular locations were Moore Square (22 likes) and Raleigh Amtrak Station (20 likes). Based on a rough count of bicyclists during Bike to Work Day, we saw a good number using the Reedy Creek Trail to get to work, and the numbers will only increase once we construct the Gorman St Connector (http://www.raleighnc.gov/business/content/PlanDev/Articles/TransPlan/GormanStreetConnector.html). We like riding from downtown to NCMA so much that we established the Art to Heart Corridor a few years ago (https://www.raleighnc.gov/content/PlanDev/Documents/TransPla%20n/BicycleProgram/ArttoHeartFINAL_051314.pdf). It’s a great out-and-back ride at just under 12 miles total. We’re aware of (and totally okay with) the possibility that people will get to NCMA by car but then rent bikeshare to tour the NCMA Park. Not everyone is ready to jump wholeheartedly into bicycling, but we’re hoping lots of folks will be open to trying bikeshare for an afternoon, even if it’s just to ride around a park. While I agree that the Blue Ridge Rd corridor isn’t very bikeable in its current state, it is the location of Raleigh’s first separated bike lane, and we’re currently working on a design to add sidewalks and separated bike lanes from Trinity Rd to just north of Reedy Creek Rd (https://www.raleighnc.gov/business/content/PlanDev/Articles/TransPlan/BlueRidgeRoadImprovements.html). There is really great stuff happening in Raleigh on the bicycling and walking front.